I've always loved New Year's Eve. I remember being a kid and drinking orange pop from champagne flutes, wearing party hats and celebrating with my family. My early 20s before motherhood saw NYE spent at clubs with my friends, but I secretly hated being there. I hated the sticky floors and being around loud drunk people ( I was always the designated driver). I'm currently in the process of building up our board game collection, so game nights have been on my mind lately and New Year's Eve is the perfect time to host one! This one is for the older kids/teenagers or for the adults who don't want to or can't drink. My friend's and I always had a tradition of making non- alcoholic Shirley Temples over the holidays. There was just something so special about being able to make fun holiday drinks in fancy glasses. Buy some fun mini umbrellas and different fruit to garnish with. Holidays at my dad's house always included a yankee swap. We would make lots of food and invite the family over to play a few gift-giving games. Yankee swaps aren't just for Christmas- they can be fun on New Year's Eve too! Grab your winter gear and head out for a fun day of sliding or skating! Finish the night off with hot cocoa at home, some good food and a New Year's countdown. This one is for the brave parents out there- let your kids host a sleepover with their friends or cousins! They can watch movies, make slime, play with their new Christmas toys etc. Take the kids to a hotel for the night for a little pool party! Enjoy the pool for a few hours, then head on up to the room for movies, popcorn and the countdown. 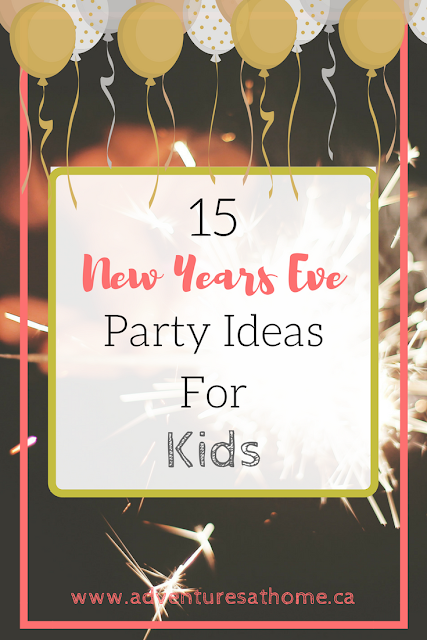 Make your own photo booth with different props from the dollar store- New Year's Eve hats, glasses, necklaces, signs, etc. Using a toy net or sheet secured to the ceiling, fill it with balloons to release at midnight! Fill paper bags full of fun snacks and activities for the kids! They can take 1 item out every half hour until midnight! Have a scavenger hunt around the house leading to a fun prize (one prize for each child to be fair). Each clue can be a memory from something that happened that year! Have each child decorate their own party hat with glitter, pom poms, numbers, etc. If you wait until after the New Year to take down your tree like we do, cover your tree with balloons- each balloon having a piece of paper in it with an activity to do leading up to midnight. Pop the balloon to see what the activity is! Order in take-out (we love Chinese food for New Year's) and watch all of your favorite movies from that year! Comment below and tell me what your favorite thing to do on New Year's Eve is!